Avior Jewelry in Dallas, Texas, has announced an expansion of its unique collection of pre-owned Rolex watches, perfect for those who want a high end timepiece to impress in their day to day, without the hefty price tag. Avior Jewelry in Dallas, Texas, has announced it has a whole new range of luxury pre-owned Rolex watches for sale, for all those who want a high end watch that can make the right first impression on a budget. These include everything from the more simple, traditional Date Just timepiece to more sophisticated options like the Submariner or the Milgauss, all provided with a unique two year service warranty at no additional cost. More information is available at https://aviorjewelry.com. Avior Jewelry is the store most in Dallas and the nearby areas in Texas turn to when they want to get fine diamond jewelry, great engagement rings and luxury timepieces at wholesale prices. The Dallas jewelry store has continued to expand its unique collection of pre-owned Rolex watches, perfect for those who want a high end timepiece to impress in their day to day, without the hefty price tag. These used timepieces join a wide collection of luxury, pre-owned Cartier, Ebel and Tag watches, a unique variety of diamond bracelets or fashion hoops, and unique wedding bands or engagement rings for couples in love who need truly really special to bind them together for a lifetime. The store is always staffed by friendly pros who treat everyone like they’re a part of the family and who love to help find the right fit for every taste, personality or occasion. For added convenience and peace of mind, their fine diamond jewelry and the engagement rings are provided with lifetime warranties and a complimentary appraisal for insurance purposes. 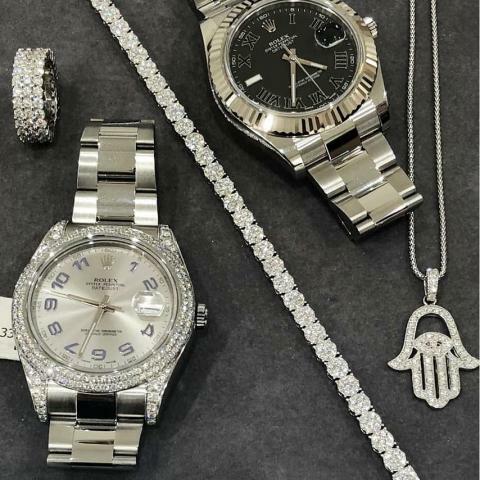 To see these new pre owned Rolex watches and all the other fine diamond jewelry or wedding rings Avior Jewelry has in store, the public can go to their location in the United Texas Bank Building on 13101 Preston Rd., call 214-741-7129, or visit the website at the link provided above.